Survey Department map of Kataragama. Click on map to view at full size. Kataragama is a remarkable place of worship and pilgrimage in Ceylon. This renowned temple, unlike those of India, which are distinguished for their magnificent courts, corridors, and colonnades, spacious portals, and imposing lofty towers, has no claims to architectural pretensions. It is only a small plain oblong brick building with a tiled roof 50 feet long, 20 broad, and 15 high, partitioned into three rooms or apartments, of which the one in front is opened towards the south in the shape of a portico for the accommodation of its worshippers. The front of the temple thus faces the south. The roof of this temple has no pyramidal towers or conical domes attached to it, but is surmounted only with a couple of gilt copper vases, having tapering points like spires. The walls are painted outside with figures of different shapes and characters, representing battle scenes and the gods and giants engaged in them. These are, however, obscured and concealed by a thin coat of recent whitewashing. The inner roof or ceiling of the middle room is decorated with painted cloth. A large curtain hangs in front of the innermost room, screening its entrance from the gaze of the people. This apartment is the most secluded part of the temple, and has no kind of openings or windows for the purpose of ventilation or light, with the exception of a door between it and the middle room. This is the adytanam, or sanctuary, where the idol or symbol of the god is deposited, and into which none, not even the officiating priest, can enter at random, as it is believed that the invisible deity himself is enshrined in it: and in front of this sanctuary is the middle room already described, where the devout worshippers are allowed to enter and make their offering to their god. The area or space surrounding the temple, about 3 roods in extent, is enclosed by a brick wall, which is about 6 feet high. This enclosure is almost square, and within it there are also a great many smaller shrines dedicated to numerous minor gods and goddesses, including one to Ganapati and another to Teyvani, who are respectively the brother and first consort of Kataragama Devi. There stands also a lofty magnificent Bo tree close to the temple of Ganapati, or god of wisdom, sacred both to Buddha and Vishnu, who, according to Hindu mythology, is said to have appeared in his ninth avatar, or incarnation, in the person of the former to introduce a strange reformation and spread atheism in India. Hence the contention between Sivaism and Buddhism, and extinction of the latter in India, and its introduction into Ceylon, Burmah, China, Siam, etc. The ingress into, and egress out of, the sacred precincts of the temple are secured by entrances on the south and north sides. The former, consisting of covered portals and an open gateway and a small door, are situated in front of the temple, from which a spacious passage more than three hundred yards in length and twenty in breadth, leads to the shrine of Valliammal, whose marriage with Kataragama Devi, as his second consort, is commemorated by this festival. The sandy bed of this river at the ford, in front of the Chetties’ chatram, or inn, is more than fifty yards broad; and though it is a perennial stream of some magnitude, it frequently dwindles, during a part of the year, when the weather is hot and dry, especially in the months of July and August, into a small rivulet of pure transparent water easily fordable and scarcely two or three feet deep. At this dry season the greater part of its bed remains empty and dry under the overhanging and shady branches of the majestic trees that grow luxuriantly on its steep banks, which are in many places more than 100 feet in height. These banks are firmly held and supported, as it were by plaited roots of these lofty trees, of which the kumbuk occupies a most prominent position, growing as it does to a very large size, not only here, but on the banks of all other rivers that I have seen in this district, such as the Valave, the Kirindi, and the Kumbukana, or “river of Kumbuk treas.” It is impossible, I may here remark, to conceive the rapidity with which the Manik Ganga often resumes its original magnitude, as I myself witnessed it on the occasion of my first visit to this temple, in 1868, on my way to this station from Batticaloa, and metamorphoses itself into a broad, deep, impetuous, and dangerous current, within a few hours, after a heavy rain in the interior hilly regions in which it has its source. The aspect and natural features of the country surrounding the temple of Kataragama are not calculated to make a favourable impression upon the eye when they first meet it. There is nothing in them to attract or invite it. Everything, with the exception of the temple and the river on which it stands at the village of Kataragama and its vicinity, looks wild, dreary, and monotonous. In this isolated and barren spot, in the heart of the jungle, removed far away from the haunts of civilisation and scenes of busy life, there is such an aspect of desolation and emptiness, as soon as the place is deserted by the pilgrims and other visitors, immediately after the close of the festival, that one is inclined to hurry away from it with all possible expedition. It consists of only a couple of streets originally opened for the purpose of perambulating the image during the annual festival. There are some fifteen dwelling huts, mud-walled, and partly tile-roofed; as they are also used, during the period of festival, as boutiques, on the sides of these streets, which surround in front of the temple premises, a square block of ground, about an acre in extent, of which the Chetties’ chatram, a neat brick building, occupies more than a quarter, and has a substantial wall built all round it. The population of the village may be estimated at forty, including men women, and children; but it is liable to fluctuation at different periods of the year, from the influx and efflux of the pilgrims who resort to the temple. And I need scarcely add that the village, its adjacent hills, and the surrounding country, are all temple lands, and their occupants are attached to the temple service as its tenants. The village of Kataragama is situated at the southeast of the Island, on the left bank of the Manik Ganga, at a distance of more than 40 miles northeast of Hambantota, and about 60 miles southeast of Badulla. It has a road practicable for carts from the former. Judging from the height of the surrounding hills, its elevation above the level of the sea cannot be more than a hundred feet; and its soil is sandy and barren, mixed with gravel and stone, the surface being generally covered with dense thorny jungle and stunted vegetation, without any sign of cultivation. From its situation it is exposed to strong hot land wind during the southwest monsoon, which prevails here at this season of the year. It would thus appear that this solitary and barren village, situated as it is in a malarious district, without any natural advantages, is entitled to no distinction, except in connection with its holy shrine, which itself has no artificial or architectural attractions, as I have already stated. Its only attraction consists in its sanctity as the place where Kadiraman or Kartigesan, the lord of the rays and god of war, halted on one of its hills, on his way to Kailasa, the abode of his father Siva, in the eternal snows of the lofty Himalaya or Imeyamalay, which is fabled to have given birth to goddess Parvati, his consort. This legendary incident appears, according to the Skanda Purana, to have occurred when he returned after his long and bloody wars with the Asuras, who had enslaved the gods, from Meyandrapui, their stronghold, which is supposed to have been immersed, at the time of their destruction by this terrible god of war, in the Eastern Archipelago, at a remote period, long anterior to that of Rama and Ravana, who are said to have flourished nearly 24 centuries before the Christian era. It is in commemoration of this event or appearance of Kataragama Devi on one of the seven hills, and in token of the celebration, of his marriage with the goddess Valliammal, which took place on the left bank of Manik Ganga, that this shrine is built on it and dedicated to the god who bears, among others names, the appellation of Kadiraman, or “the lord of the rays,” in consequence of his having proceeded from the middle or frontal eye of Siva, which is described in the Puranas to be so refulgent with rays of light and sparks of fire that an angry glance of is quite enough to consume the whole universe. Hence Siva is the destroyer in the Hindu Triad. Kataragama Devi is known both in the Sanskrit and Tamil languages by many other proper names descriptive of his attributes and actions. He is called, for instance, Arumukam, or “the six-faced god,” Kandan, or “the lord of the hills,” Velan, or “the holder of the sacred weapon called Vel” with which he had destroyed Suran, or “hero of heroes,” the king of Asuras. He is called also, by the way of distinction, the god of war, and generalissimo of the 330 millions of gods, in the wars he waged against Suran to deliver them from his tyranny. It was for the special purpose of accomplishing the extermination of the Asuras and their dreaded king and matchless warrior Suran, that, at the earnest supplication of Vishnu, who was deputed by the gods to proceed to Kailasa, and represent their grievance to Mahadeva or Siva, against the Asura king, whose oppression and tyranny they could no longer bear, that he was graciously pleased to send against the tyrant his son, Kadiraman, who, having, as already noticed, emanated from his own person, is considered equal to Siva himself, and as such dreaded and adored throughout all India and Ceylon by the Hindus, who are devoted to the worship of Siva. The veneration, therefore, in which this temple dedicated to the great god of war, is held by the Hindus; the intense interest manifested by them, especially the Chetties, in its yearly festival and their blind confidence in the supposed supernatural and invisible powers associated with this hallowed spot, its holy river, and its sacred hills, are so great and profound, that pilgrims from all parts of India and Ceylon are still in the habit of resorting to it year after year, without being deterred by the fear of losing their health, and even their lives, from sickness on their journey to Kataragama, through an inhospitable and malarious district, productive of fever and cholera. In the legendary history of Hindu literature there are, besides Kataragama, its hills and river, many other hollowed spots sacred to the objects of religion, and these are generally mountains, promontories, and rivers, which have become celebrated by some real or imaginary events connected with them, as stated in the Puranas. Such, for instance, are Adam’s Peak, the sacred promontory at Trincomalee, the lofty Himalayas, the holy Ganges, etc., which are all held in high veneration by the orthodox Hindus, who visit them as pilgrims. The numerous festivals, therefore, which are annually celebrated throughout India and Ceylon on these sacred spots are connected with some special events which they are intended to commemorate. The particular festival, which forms the principal subject of this report, commences annually in the month of July, with the new moon, and continues for a fortnight, until the full moon, which frequently occurs in the first week of the following month as it did this year. It is held, as already stated, in honour of Kataragama Devi, in commemoration of his marriage with the goddess Valliammal. This festival is conducted in the following manner. The image is brought out from the temple completely enveloped in cloth; carried in procession every night by a Kapuwa, who sits with it on a colossal effigy of an elephant, made for the occasion for want of a live one, which used to be employed in former years. As the procession slowly moves every eye is turned towards the venerated object on the back of the effigy; and the most enthusiastic attention is paid to the whole ceremonial by the devout worshippers, while the shouts and acclamations from the tumultuous crowd, the waving of flags, the burning of lights, ringing of bells, the blowing of pipes, and the beating of drums or tom-toms give to the whole scene an air of animation and life, combined with devotion and piety, scarcely to be met with in any other place of Hindu worship in Ceylon. Every one is now lifting up his hands in adoration to Kataragama Devi, invoking his name and believing in his presence in the symbol, as the latent spark of fire is present in a flint stone. The procession now halts in front of the temple of Valliammal, and there, amid the din of discordant music and the smoke of fragrant incense, the officiating priest or Kapuva is seen engaged in doing puja and receiving the offerings of expectant worshippers. After this Puja, or worship, the procession wends its way back to the temple of Kataragama Devi, where the symbol is taken off the back of the artificial elephant and deposited again in its holy shrine amidst the loudest acclamations and the din of deafening music, which seem to rend the air. During the stay of the procession at the temple of Valliammal, it need scarcely be remarked, the legends of the god and goddess are recited by one or more of the Hindu priests present, when the utmost interest is exhibited by the crowds gathered therein listening to them. The procession is not of an imposing character until the arrival of the Sami or Vel from Colombo on the second week after the commencement of the festival, when it gradually increases every night in importance and magnificence in proportion to the length of its duration, and attains its highest degree of splendour on the night preceding its last day. On this particular night the image is carried into a Vihara and a Dagabo, which are both in total ruins, at a distance of about 50 yards to the north of the temple. Here is performed a sort of Buddhist ceremony by an unnanse, in which all classes of worshippers, including the Hindus, are seen vying with each other in presenting their offerings at the site of the Vihara. On the last day of the festival, after observing some hybrid astronomical phenomena as to the precise hour of the full moon. an aquatic procession takes place to perform the ceremony of cutting water within a magic circle drawn in the river by the officiating priest with a sanctified sword or rod. On this occasion the image is placed in a palanquin perfectly enveloped in cloth, taken out of the temple and bathed in the already encircled and sanctified part of the river. At this auspicious moment, while the image is still being immersed with its vehicle in the river, the music commences from various instruments already mentioned, producing the most discordant noise that can be imagined; and the concourse of the people, amid the loudest acclamations, make obeisance to the bathing god with upraised hands, and plunge themselves into the sacred stream with a superstitious belief that this holy ablution will cleanse away all their former sins and secure them all the blessings they can desire in this or the next life. With this last ceremony of cutting the water and bathing in the river ends the celebrated festival held in commemoration of the events already noticed; and identical spots are here pointed out in connection with time, as described in the Skanda Purana. The particular spot, for instance, where Kataragama first met Valliammal in the guise of a hungry and thirsty pandaram, or mendicant, and begged of her to appease his hunger and quench his thirst, when she was watching her chena cultivation as the adopted daughter of a Vedda chief, and preparing cakes from a composition of honey and sami or milled flour, is pointed out at a distance of more than four miles from the temple. The precise spot again with footmarks of an elephant on a rock, where she had suddenly encountered the ponderous brute and entreated the pandaram to protect her from its attack, is also shown to the enthusiastic pilgrim. It may not be out of place to remark here that the Mohammedans also participate in most of the superstitious ideas associated with this temple, and stoutly assert that there is a hidden spring in its immediate neighbourhood, close to the bed of the river, the water of which has the power of rendering life immortal, as it did to one of their saints, named Kadra Nabi, who had first discovered and drank of it. Under this impression they have also a small monument, close to the temple of Valliammal, dedicated to their saint, and take part in their own way in the celebration of this festival, during its continuance burning incense and saying prayers every night. This festival shows in an unmistakable manner the power that superstition holds over the mass of the people; and there is no doubt that these different classes of worshippers believe all the absurd and superstitious stories which are related of their gods and saints. During the festival a kind of fair is kept up in the neighborhood of the temple, where an encampment for the pilgrims was put up on the right bank of the river at Government expense. Traders in all kinds of wares were here assembled, taking advantage of the festival, to establish a vast fair for the transaction of business, selling and exchanging all sorts of wares and goods. There were, including hopper women, more than 200 boutique-keepers, composed of Moors, Malays, Sinhalese, and Tamils. The Sinhalese came from 20 and 30 miles away for the double purpose of combining the business of life with devotion, selling such produce as they brought, and purchasing what they required. There were brass wares of very superior workmanship, in the shape of pitchers, plates, saucers, cups, trays, lamps, and bells brought in large quantity from Galle, Tangalla, and Batticaloa, and disposed of at very profitable rates. In the temporary boutiques opened in the lines, besides brass ware, articles of all descriptions and varieties were spread out for sale, such as cloths, ready—made garments, shoes, slippers, pictures, looking—glasses, dolls, books, papers, as well as rice, meat, cocoanut, dry fish, curry stuffs, spices, coffee, tea, jaggery, sugar, betel bundles, cheroots, arecanuts, camphor, frankincense, without omitting also beer, wine, porter, and brandy into the bargain, and, in short, every description of necessaries and luxuries of life, whether fit or unfit for use. The total number of pilgrims and visitors who attended the festival and fair at Kataragama may be estimated at between 3,000 and 4,000 persons, the Malabar element, of course, preponderating over the Sinhalese in the proportion of 2 to 1. The total number thus congregated, either for devotion, pleasure, or gain, attained its maximum figure on the second week of the festival, only after the arrival of different Vels from Colombo, Kandy, Galle, Ratnapura, Gampola, and Badulla. There were altogether seven Vels or Swamis brought to the temple by the Chetties and Tamils from the places above-mentioned. I shall close my description of the festival with a few remarks on the origin of the worship of the Vel as an image, as well as of the temple of Kataragama. The Vel (javelin) is a symbol of Hindu worship, being the sacred weapon with which Kataragama Devi destroyed Suran, the King of the Asuras. This supernatural weapon was specially formed and given to him by his father Siva, as the only instrument that could penetrate through the invulnerable body of Suran. The supernatural power of the Vel consists in its becoming personified at the command of the great god of war, and executing his will as an instrument of destruction against his enemy Suran. All other offensive weapons used by him against the Asura King in his last battle with him completely failed to make any impression upon his invulnerable person, from which they had all rebounded at once as from a statue of adamant. In one of the battles which this incomparable warrior Suran fought with the terrible god of war and his immense army of gods and genii, he is described as standing alone in his war chariot, Indramahasalam, and addressing himself to his surrounding enemies in a most contemptible manner: “O ye gods, demi-gods, and genii of the heavens above, of the earth below, and of the infernal regions under the earth! You have all presumed to come and fight against me with an unbounded confidence in the prowess of your generalissimo Skanda Swami, a stripling that was only born the other day. I stand here alone and unarmed, even without bending my bow, on the strength of my own invulnerability and invincibility, which I have gained by my severe austerities and sacrifices from Mahadeva (Siva). I defy one and all of you to direct against me all the instruments of destruction you may have in your possession.” At this defying and threatening attitude assumed by Suran all the gods and genii were terrified and retreated. One of their generals alone, named Viravaku Devi, the brother of Skanda Swami, boldly advanced and discharged at him many formidable weapons, including those given to him by Brahma and Vishnu. These last became at once personified, and after addressing themselves to the holder, proceeded as swiftly as thought, with the avowed purpose of annihilating Suran; but their strenuous efforts to plunge themselves into his body and take away his life were as ineffectual as those of beetles which attempt to bore through a mountain of flint. In his power of invulnerability Suran may be reckoned even superior to mighty Achilles, and I may here add that the description of the battles between Kanda Swami and Suran, and of their exploits recorded in nearly 50,000 lines of sacred verse by Vyasa Muni, will not suffer from comparison with most epic poems. 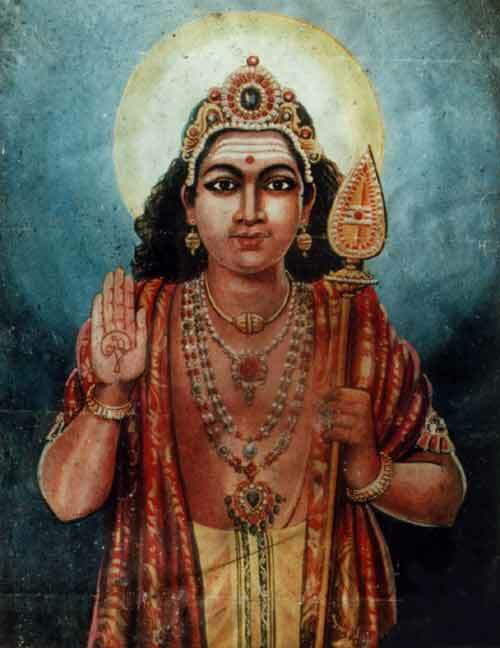 The Skanda Purana, as it exists in Tamil, is the production of Kaddiapper of Vanjipuram. The story of the origin of the present temple of Kataragama, according to tradition, is nearly as follows. In the second century before the Christian era, when Kavantissa who built Tissamaharama Vihara, about 180 B.C., was the ruler of Mahagama, and a tributary prince to the Malabar King Elala, who then ruled over all Ceylon, having established his capital at Anuradhapura. Dutugamunu, the son of the former, conceived the idea of liberating his country from the dominion of the latter. While his thoughts were constantly engaged in the design both day and night, he was warned in a dream not to embark in this dangerous enterprise, contrary to the positive injunction of his father, unless he could, by a pilgrimage to, and penance at, the shrine of Kataragama first secure the divine interposition of the god of war in his favour. The day after his dream, the prince, all of a sudden, put on the garb of a pilgrim and proceeded to Kataragama with only ten of his followers, who had subsequently become his favourite generals and warriors, He remained at the holy spot on the bank of the Menik Ganga, performing for a fortnight acts of devotion and penance imploring the supernatural aid of the god of war in his warlike expedition against the usurper. While he was thus engaged in prayer and meditation there appeared suddenly before him a pandaram, or mendicant, but his presence had produced on the prince such an indescribable feeling of reverence and fear that he was at once awestruck, and he fainted and fell at his feet. He soon recovered consciousness and prostrated himself before the god who appeared in the guise of a mendicant. Here the terrible god of war stood in bodily presence before the terror-stricken prince, and assured him that his arms would surely prevail against Elala, and that he would fall a victim to his javelin if he encountered him in single combat. After the assurance of victory thus graciously vouchsafed to him by Kataragama Devi, the prince departed with a gladdened heart, making a vow that he would build a temple and dedicate it to him immediately after his return from Anuradhapura, where he at once proceeded with an army to give battle to Elala and kill him in personal fight, as revealed to him in his vision. It is, therefore, believed that the present temple was built more than 160 years B.C. by the conqueror of Elala, and largely endowed with land revenues arising from several villages and fields set apart by him and his successors in the south—eastern division of the Island for the maintenance of the temple. These endowments were originally intended to be appropriated to the service of the temple in performing its daily pujas, conducting its periodical festivals, repairing its different buildings, and maintaining its priests and attendants. A Basnayaka Nilame, or manager, is now appointed to manage the affairs of the temple, to collect its revenue and control its expenditure; and I believe a portion of the annual income, say at least £100, arising from the offerings of the people, is shared between himself, the kapuralas, and other male and female temple attendants, who are engaged in the due performance of its several rites and ceremonies. It is not unusual nowadays for the temple tenants to neglect their regular attendance on the festivals, as required by their tenure of the temple lands. I cannot here refrain from recording as the result of my own personal observation, during the present festival that the temple of Kataragama is fast losing that celebrity which it has been long enjoying throughout India and Ceylon. Account of Dr. M. Covington published in "The Manuel of the Uva Province" (1873) by Herbert White, C.C.S.. It first appeared in the Literary Supplement to The Examiner. It also appears in Kataragama and its Festivals 1819-1939 ed. W. Lionel Fernando (Colombo: Ananda Press, 1985) 42-51. I camped in the bed of this river on the first night of my stay in 1889, but next day I was compelled to evacuate “bag and baggage” owing to the sudden rise of the stream.—H. W.
 Etulvidiya, or ‘inner street’, and Pitavidiya, or ‘outer street’ — H. W.
 A very dangerous wind. My pony was so affected by this, that for days together it could not walk two or three paces at a time without falling. It seemed completely paralysed.—H. W.
 There is no such activity of trade now. I had to send 16 miles for fowls and paddy.—H.W.